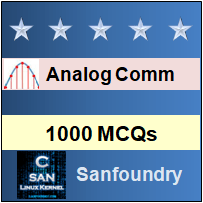 This set of Analog Communications Multiple Choice Questions & Answers (MCQs) focuses on “Frequency Translation”. Explanation: FSK stands for Frequency Shift Keying. In FSK, information is transmitted through discrete frequency changes in carrier signal. Explanation: For a transmission line, inductance and capacitance are two components that are considered as distributed. 3. What effect will be seen on the resistance of a wire if we increases the frequency? Explanation: Skin effect becomes more and more apparent as frequency increases as skin depth becomes smaller. It is due to alternating current flowing through the outer surface of conducting material. It refers to the increase of wire resistance with frequency. 4. What is speed of radio waves in free space? Explanation: he speed of radio waves in free space is same as the speed of light which is 3 x 108 m/s. It cal also be written as 300 x 106. Explanation: Isotropic radiator is considered as an ideal antenna. So all the gains of any antenna is estimated by comparing with it only. Explanation: Ground wave is generally preferred for long distance communication using frequencies which are below 3MHz. It can be used for short distance communication by using frequencies between 3 and 30MHZ. Explanation: Microwave frequency range is considered to be start at 1 GHz. It is standard and fixed. Explanation: In telecommunication, jitter can be seen as a deviation from true periodicity of a presumably periodic signal. Higher level of jitter are more likely to occur on either slow or heavily congested link. In any circuit, adding additional repeaters finally increase the jitter only. 9. What is the approximate reliability of a microwave system? Explanation: Microwave system is mostly known for its reliability. Its reliability is of the order of 99.99%. 10. Which modulation is used by a microwave system? Explanation: Microwave system is used for point-to-point communication links, which is the communication between two nodes. It can either use frequency modulation or single sideband modulation or quadrature modulation.